Ballpark Estimate: $639 Million (1914 dollars); $14.3 Billion (2007 dollars). Until 1914 the only way to transport goods by ship from New York City to San Francisco was along a circuitous 12,000 mile route around the tip of South America. For many forward-looking leaders in the U.S., cutting a canal across the Panama Isthmus made a lot of sense since this new route would only be around 5,000 miles. In this regard, the canal would make the journey to the west coast easier, a lot safer, less costly, and so much faster. Instead of around sixty days to make the voyage it would take about eleven. In addition to the United States, many European leaders since the sixteenth century also thought this shorter route to the Pacific was absolutely essential for expanding their trade with the Pacific coastline and the Far East. It wasn’t until 1880, however, that a French engineer, Ferdinand de Lesseps, with the consent of Columbia, began to construct a canal across the Isthmus of Panama that would link the Atlantic with the Pacific. It would be a Herculean effort but De Lesseps was enthusiastic over the prospects of such a project, a challenge mostly inspired by his success in building the Suez Canal. Soon thousands of workers arrived, mostly the locals and laborers from the West Indies working for about $125 a month. With steam shovels, excavators, dredges, and explosives, they hacked a broad swatch through the nearly impenetrable jungle. Over the following years, however, the project failed not only because the extent of the effort was grossly underestimated and poorly designed, but also from severe financial difficulties, corruption, mismanagement, and most significantly, disease. One of the largest contributors to the project’s failure was yellow fever and malaria. In fact, between 1881 and 1889 it was estimated that approximately 22,000 employees, from laborers to directors, died of yellow fever and malaria. Once the rains came to the sweltering and bug infested jungle the unfortunate victims were mostly the white Frenchmen since the locals, although immune to yellow fever were quick to succumb to malaria. Since the infectious role of the mosquito was unknown at the time, even hospital patients with minor ailments often fell victim to its bite thanks to the open and unscreened windows and doors of the wards. With large numbers of workers off the job at any given time, either from sickness, death, or because many simply quit and returned home, it became very difficult to maintain an active and experienced workforce. Under these unstable conditions it was inevitable that production schedules were impossible to meet which only drove up the cost and jeopardized the entire project. By 1893, the French realized the futility of continuing this enormous project and began to search for a purchaser to finish the canal. But because their records were so poorly maintained, their total cost for the 24 years of work performed in Panama is reported only as an estimate. Now that the French were leaving, their asking price for the work already done and the remaining equipment was $100 Million. The only likely buyer was the United States who at the time was interested in building a canal across Nicaragua in order to give the U.S. Navy rapid access to the Pacific Ocean. Nevertheless, following back room deals and lobbying efforts politicians are notoriously famous for, a deal was struck in 1902 between the U.S. and the French for only $40 Million. And in 1903, following her independence from Columbia, Panama granted the U.S. the right to complete the canal. If that wasn’t enough, gratified over the support the U.S. gave Panama during her fight for independence, Panama also gave the U.S. full control of the Panama Canal Zone. When American workers arrived in May 1904 and began to fall ill, medical investigators were immediately dispatched to the worksite. They discovered that a particular species of female mosquito was the carrier of yellow fever and the principal cause of so many deaths. 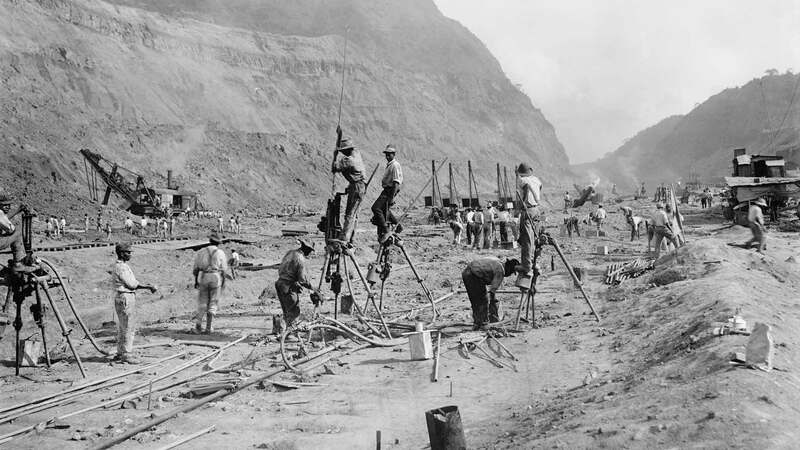 After widespread measures were taken to nearly eradicate the disease, by 1905, conditions at the worksite had noticeably improved and work on the Panama Canal resumed once again. Nevertheless, in spite of the medical advances to combat these infectious diseases, over 5,600 workers died during the American construction years. Finally, after an additional decade of hard labor, work on the Panama Canal was completed in 1914 and was formally opened that August. Consisting of artificial lakes and channels, the water level within the 50-mile long canal is controlled by three sets of locks. The massive lock gates consist of two doors, each 65 feet wide, 7 feet thick, and range in height from 47 to 82 ft. The locks have a total of 6 steps and each of the steps has two chambers. Each lock chamber is 1,000 ft long, 110 ft wide, and 41 ft deep. The lower portions of the side walls of each chamber range from an incredible 45 to 55 ft thick, tapering off to around 8 ft at the top. They are capable of raising ships from sea level in one ocean to a height of 85 feet and back to sea level in the opposite ocean. If conditions are exactly right and everything goes smoothly, the time it takes to get through the canal is about 15 hours, whereas normally, with some delays, it takes anywhere from 24 to 30 hours. If there is a heavy backup of waiting ships, the average time is more like 44 hours. For container ships the tolls are assessed at $54 per container. For example, if a ship is carrying 4,000 containers the cost to the owner will be $216,000. For small crafts, the tolls are based on the size of the vessel. They range from $500 for boats up to 50 ft in length to $1,500 for those over 100 ft.
On September 7, 1977, President Jimmy Carter, before an audience of eighteen Presidents at the Organization of American States, signed a pair of treaties which began the process of transferring full control of the Panama Canal over to Panama, an act that was completed in the year 2000.